This picture was taken in front of the Krishna temple at Dakshineswar in 1884, when Sri Ramakrishna was 48 years old. 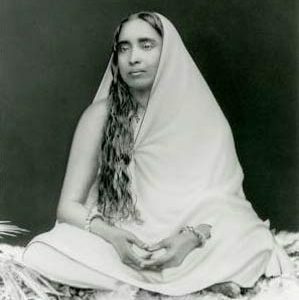 According to Swami Nirvanananda, “Bavanath Chatterjee, the Master’s devotee from Baranagore, wanted to take a photograph of the Master. One day he requested him very strongly to give his consent, and on the afternoon of the next day brought a photographer along with him from Baranagore. He could not make the Master agree. The Master just went away near the Radhakanta [Krishna] temple. “In the meantime Narendra arrived on the scene and heard everything; he said, ‘Wait a bit. 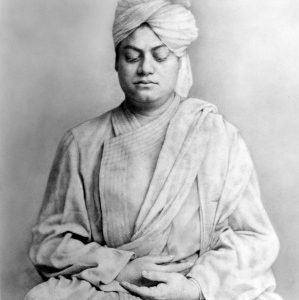 I shall put everything straight.’ Saying this, he went to the veranda to the west of the Radhakanta temple where Sri Ramakrishna was sitting and started a religious conversation with him. The Master went into samadhi. Swamiji went and called the others and ordered them to get ready quickly to take the picture. “In the state of samadhi the Master’s body was bent on one side and therefore the cameraman went to make him sit erect by softly adjusting his chin. But as soon as he touched his chin the whole body of the Master came up like a piece of paper – so light it was! “Swamiji then told him, ‘Oh, what are you doing? Be quick. Get the camera ready.’ The cameraman took the exposure as hurriedly as possible. The Master was completely unaware of this incident. “After some days when Bavanath brought the printed copy of the photo the Master remarked: ‘This represents a high yogic state. This form will be worshipped in every home as time goes on.’” (“Concerning the Photographs of Sri Ramakrishna” by Swami Vidyatmananda; Vedanta and the West, No. 172). “Disciple: Mother, that photograph of Sri Ramakrishna which you have with you is a very good one. One feels it when one sees the picture. Well, is that a good likeness of the Master? This picture which Sri Ramakrishna worshipped is now on the shrine at the Udbodhan Office in Calcutta, where it is worshipped daily. 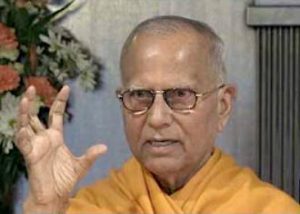 This fact was authenticated by Swami Madhavananda, Swami Vireswarananda, and Swami Nirvanananda. 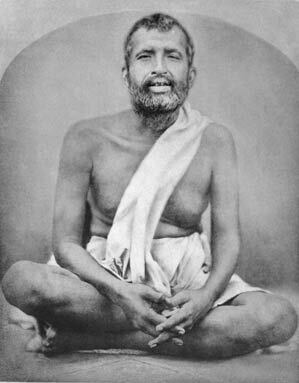 Swami Atmabodhananda, who was the head of Udbodhan for many years until his death in 1959, stated that the Udbodhan print was the same one that Sri Ramakrishna worshipped at the nahabat. (“Concerning the Photographs of Sri Ramakrishna” by Swami Vidyatmananda; Vedanta and the West, No. 172). In 1982 Swami Chetanananda received a negative from the original picture of Sri Ramakrishna mentioned above. It was made by Braja Kishore Sinha, the Curator of Victoria Memorial Hall, Calcutta. Swami Chetanananda brought that negative to the United States and gave it to Mr. John Hench, Vice President for Creative Development of Disneyland, who worked on this picture for two years. Mr. Hench carefully removed the scratches, black dots, and other imperfections from this historical, one hundred-year-old photograph without disturbing its originality.